12 pm. to 5 pm daily. Ranakpur is famous for the beautiful Ranakur Jain Temple that is one of the five major important pilgrimage sites in the Jain religion. Around three to four lakh devotees and tourists visit this Jain temple every year. Lies at a distance of 95 kms in the north of Udaipur city, it is a must visit destination for anyone traveling to the region. It is located in the Pali district of Rajasthan. The temple is known to the world for it superb architectural style and intricate carvings covering every inch of pillar, wall and ceiling. 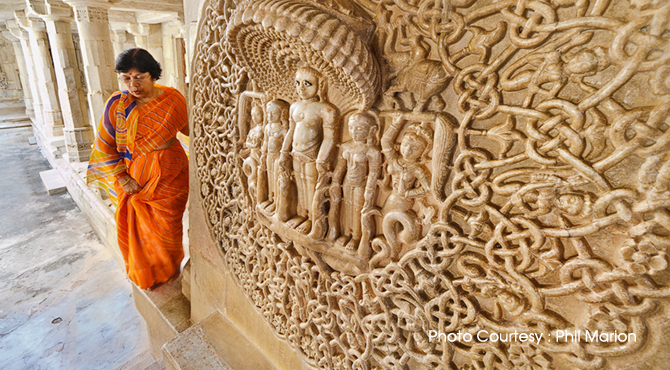 Most of the carvings depict gods and goddesses and mythological scenes. This massive marble structure temple that looks like an ancient palace is the largest temple of the Jain cult. The temple was also nominated amongst the top 77 wonders, in a contest for the new Seven Wonders of the World. The temple was built in 1439 by Seth Dharna Shah a Jain businessman under the patronage of Maharana Kumbha - one of the greatest Mewar kings. Shah took 55 years to complete this temple. 21,000 dedicated workers and artisans, under the leadership of Shri Kasturbhai Lalbhai, a wealthy Jain industrialist and philanthropist, worked on the temple's construction. The temple is actually part of a complex with four temples. Surrounded on all sides by wildlife protected area, the wooded setting, home to peacocks, langurs, various birds etc complements the temple wonderfully. The main temple is Chaumukha temple (four-faced) built in 1446. It is dedicated to the first Jain Tirthankar, Lord Rishabhnathji or Adinathji and is shaped like a 'Nalinigulm Vimana' or 'Heavenly Aircraft'. Built on a rectangular fortified platform with a large 48,000 sq ft basement. This temple has 1,444 pillars and a clustered centre tower. There are four entrances facing each of the the cardinal directions to enter the sanctum. The main sanctum is surrounded by 66 subsidiary shrines, 24 pillared halls and 80 domes. The main sanctum houses the marble image of Adinatha. Entry is Free; Camera: Rs. 50; Video Camera: Rs. 150.